A unique format from a fresh new group! Don't miss this talented group in a fast-paced, unique format inspired by true stories from the cast! 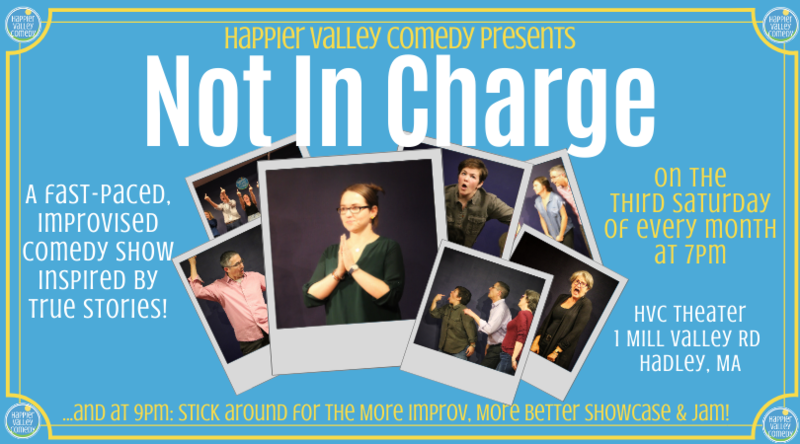 Not In Charge is Mandy Anderson, Maddy Benjamin, Sally Ekus, Kate Jopson, Julie Waggoner, and Jim Young. Our new theater only seats 60 people - buy your ticket online to guarantee your spot! Please arrive by 7:00pm or your tickets may be sold to Standby patrons. Refunds on tickets are only available up to 48 hours before the show through Brown Paper Tickets. In case the parking lot fills up, we can use the lot right next door at 50/50 Fitness/Nutrition! Enter the lot from Rte. 9, then walk across the grass. Thanks, 50/50! If tickets are sold out, you can come to the theater at 6:30pm and put your name on the standby list. ​Hang out at The Taproom while you wait! Check out our promo video by Alex Terrill Productions!